Our Swiss friends from northern BC are looking for an all-rounder at their lodge to support the daily work. The candidate(s) would help inside and outside the lodge supporting Chantal in the household, guestrooms and cabins, cooking and gardening and helping Roger with entertainment work around the lodge, the boats and the machines. Are you up for an adventure? 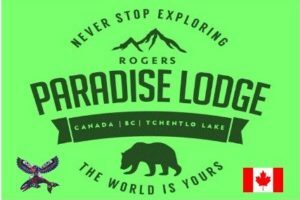 – Ideal candidates are individuals who are looking to earn some money throughout the summer season and want to spend an exciting time in the BC wilderness. For this job a retired couple would also be considered. A permanent residency or Canadian citizenship is required. If you are interested, please contact Chantal and Roger to get some more details.